Every once in a while, we get to spotlight one of our amazing customers. Schoolhouse Electric was kind enough to give us the grand tour of their US-based manufacturing facility of modern home furniture and fixtures. You can read the whole story on SAP's blog here. Schoolhouse Electric was founded by Brian Faherty in 2003 following his discovery of a long-lost collection of cast-iron glass shade molds in an abandoned warehouse. After carefully restoring them back into production, the hard-working team at Schoolhouse has continued to grow every year since. Together, they are dedicated to the preservation of American manufacturing, thoughtful living and purposeful design. Watch how Schoolhouse Electric improved their business processes to meet their demand with SAP Business ByDesign. Schoolhouse Electric plans to open a third store in Pittsburg, Pennsylvania, a former industry hub of the US. The city is a perfect complement to the Schoolhouse style. Tufts closed our conversation mentioning that without their Cloud ERP solution, Schoolhouse Electric wouldn’t exist in the market. The third store in Pittsburg would not be a reality. As with Schoolhouse Electric, Navigator Business Solutions can help your small to midsized business. See it in action! 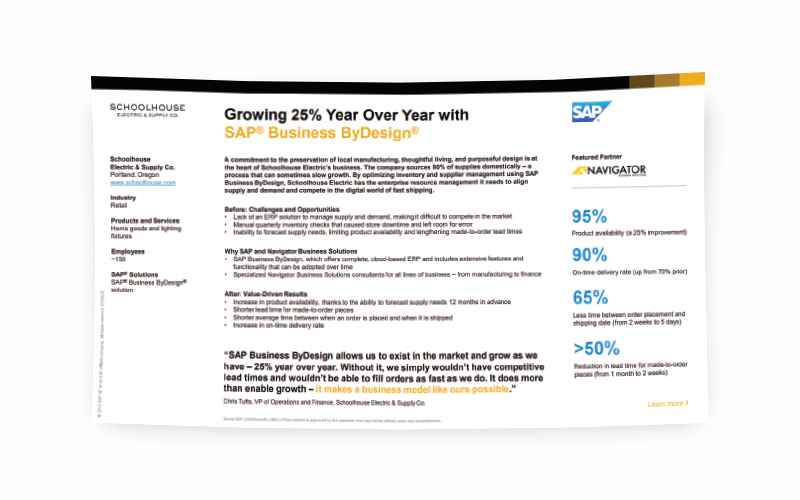 Watch a live demo of SAP ByDesign here.